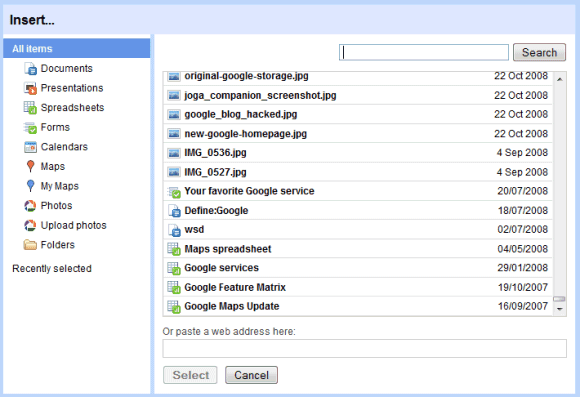 Google Sites added some new features: integration with Picasa Web Albums, feeds, custom templates. The "insert" dialog from Google Sites is Google's first attempt to aggregate the user generated data from the most important Google services: documents, spreadsheets, forms, presentations, calendars, custom maps, photos, bookmarks. Everything is searchable and you can see a list of most of the documents created using Google services. We'll probably see this dialog more often when Google adds it to Gmail, Google Calendar or when it morphs into a full-fledged service. If you don't like that the dialog is part of Google Sites, there's a direct URL for the document picker (internally named "Google OnePick"), but you can't use it to open files. I don't use Google Sites myself, so I don't know if it's coming from it... What is the "Folders" entry ? "What is the "Folders" entry ?" These are the Google Docs folders, i.e. the folders in your Google Docs account if you have one. "except for the lack of support for insert PDF files in Google Docs.."
PDFs can be uploaded to Google Docs, in which way does this differ from what you want to be possible? I mean PDF files aren't shown in the dialog described above. Very nice! But it would be even better if they intergated picasa and youtube into google docs. And add folder sharing. I agree! 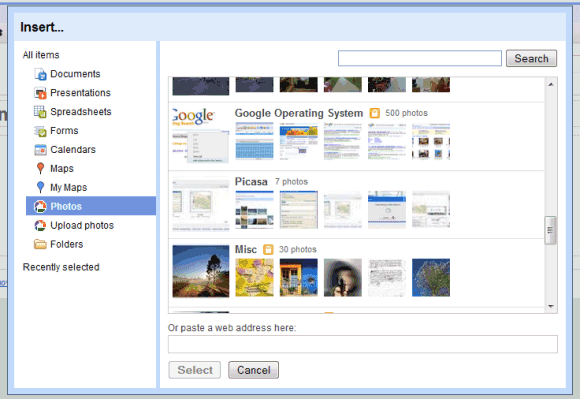 Any idea when google will merge picasa web with docs? If I'm not wrong its been more that a year now since something has been said regarding this topic. Agreed with PDF. Not being able to insert PDFs from Docs into Sites is singlehandedly preventing me from using Sites for a business solution. very usefull stuff here! like all of googles sites. Use Get Drop Box. It is the best. Much better than Docs. ah i can't wait to upload all my files to the google cloud! Please take all my files google! OK, So Folders doesn't actually share folders, but allows you to traverse your own? I wish it could actually share out the folder in some kind of widget fashion. I think that would beat File Cabinet pages in terms of flexibility for Apps business users. Is it possible to edit system footer and header in Google Sites? Some times ago I visited a Russian site builded on Google Sites WITHOUT FOOTER. But can't find at the net how to make that.